Ged is pretty fantastic, and he knows it. At a young age, Ged discovers that he has magical powers. He helps his village and impresses his elders. Ged is sent to the wizardry school to learn how to hone his powers. At first Ged feels a bit intimidated by his peers, because he doesn't know as much as them. Soon, he decides to make his motto: fake it until you make it. With this in mind, on a dare, Ged decides to perform a very powerful spell. This action will change Ged's life forever. This book was so much fun. I felt like I was reading a Harry Potter book from a different student's POV. Instead of watching a loving and caring boy make friends and learn about magic, we get to read about the kid who knew he was all that and a bag of chips and watches as his ego blocks him from his dreams. Maybe because I have been reading a lot of books told from the POV of the "nice guy/gal," it was refreshing to read a book that is about a kid that needs to get taken down a notch. A Wizard of Earthsea was originally published in 1968, and it shows in two major ways. First, this book is less than 200 pages. This means that the story is told at a very fast clip. There are not a lot of scenes that allow the readers to get to know Ged or his friends. Le Guin summarizes chunks of Ged's life when it is convenient. If A Wizard of Earthsea was printed today, it would have been divided into two books that were 500 pages each. Personally, I found this book to be a breath of fresh air. It was so different from the books that I have been reading recently. I enjoyed being able to read an epic-ish tale in under 200 pages. In addition, I was okay with not getting to know the characters super well. I read this book for the adventure, not to know Ged's deepest thoughts. The second way this book is a product of its time is how women are written. There are not very many female characters, and about half of these female characters are "evil." From what I understand, women are better represented in the other books in this series. I listened to the audio book, and I wasn't paying the best attention at all times, so I didn't notice this issue too much. This is a common complaint for this book, however, so I wanted to make sure that I mentioned it. The treatment of female characters is similar to other books from this era. Audio: There are a couple of different version of the A Wizard of Earthsea audio book. I listened to the one by Harlan Ellison. I loved it. He is a bit overdramatic and cheesy, but it really fit the book for me. I imagined that Ellison was my uncle and was reading me a bedtime story. Rob Inglis also read A Wizard of Earthsea, and many people love this version. Overall, I found this to be a great book. I can't wait to read the other books in this series. 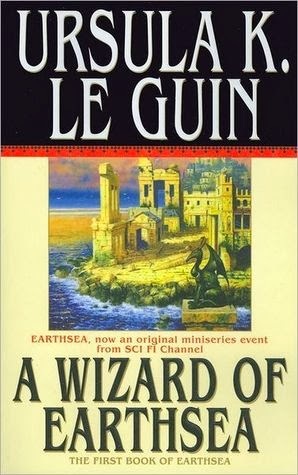 If you are looking for an introduction to Ursula K Le Guin, I think A Wizard of Earthsea is a great starting place.